Luxuriously creamy blue cheese made with milk from classy Yorkshire cows. Award winning artisan cheeses. Pasteurised. Great taste 2014. Suitable for vegetarians. 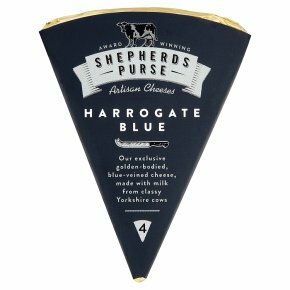 Our exclusive golden-bodied, blue-veined cheese, made with milk from classy Yorkshire cows Harrogate Blue is a soft, luxuriously creamy, blue-veined cheese, delivering a mellow blue flavour with a hint of pepper to finish.